Accounting 11 Edition Every job requires you to prepare, use, respond to, or be evaluated using accounting data. Understanding what accounting is, why it's important, and how to effectively use and prepare accounting data will give you a competitive edge in any organization. 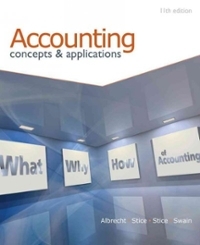 The focus of ACCOUNTING: CONCEPTS & APPLICATIONS, 11E is on developing the ability to critically analyze accounting information and make informed business decisions. Readers are exposed to a myriad of real-world examples where they can see the effect that accounting information has on the decisions made by real companies. The text also makes a concerted effort to highlight the ethical considerations and global implications of financial accounting decisions in our world.